After having my first child. 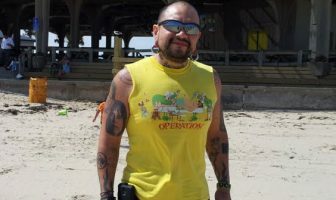 Its been 12 years since I began my weight loss journey! When I realized I was no longer happy with myself and my lifestyle. Not being able to walk without getting out of breath was no longer an option for me. Taking it 1 day at a time, learning to workout everyday and taking care of my body by changing my food choices. I think learning to love yourself through the process and even when you do not lose weight as quick as you want to. Tomorrow is another day to keep trying and pushing forward. 3 months (90 days) was when I saw hope to keep going and saw some of my results. 11 years and counting! I always make small goals for myself when it comes to my workouts, like how many pulls ups or push ups I can do. I also have learned to eat healthy and treat my body better. It’s really about helping other people. I found through helping other people lose weight, it some how keeps me going and I also feel like it heals my heart in some way. I think I realized all along it wasn’t just about losing weight although that was my goal. I truly was changing my heart and seeing myself through my own eyes, not just others. YES! If you truly are committed to losing weight, do it! Do not sweat the small things and keep your eyes on your goals. People will always have an opinion about you but yours is the only one that matters. 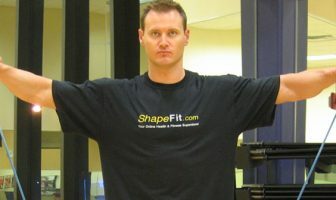 I think ShapeFit.com became another tool I used to help further my weight loss. It’s always inspiring to read other weight loss stories since it makes you realize that you’re not alone in your fight to change your lifestyle. Keep workouts short but intense. Cut out most juice, soda and alcohol. Lift weights (kettlebells, dumbbells, sandbags). I usually do not eat a big breakfast since my body just is not very hungry and I do not force food because it’s a certain time of day. I drink water and coffee most of the time. Listening to your body is big! I eat 2 or 3 cups of steamed veggies. I will usually eat beans or tofu and maybe brown rice or a sweet potato. Same as lunch. I eat mostly veggies and use olive oil, coconut, avocados or nuts to add some healthy fat to my meals. I try to avoid heavy starchy foods at night. Mostly because my body will not need it for energy and I am not active at night. Light yogurt and homemade granola, handful of almonds or cashews with fruit (half banana or apple), hummus and homemade pita chips and carrots. B-12 (metabolism), Vitamin C (immune system support), milk thistle (liver support and digestion). HIIT (high intensity interval training) weight training using 15 and 25 pound dumbbells or a heavy sandbag. I also do bodyweight exercises like pull ups, plyometrics and kettlebells 4 days a week. Jumping rope, circuit bodyweight training, HIIT interval training (outside, treadmill, stationary bike), power yoga 2-3 days a week.